Audi in Northern Ireland has for years been a huge seller, the stigma that the infamous “rings” badge portrays along with the wide range of Diesel engines available and the specifications that can be ordered, have made the brand into one that is now seen on every residential street. It’s not only that however, Audi have for decades been providing us with some of the most advanced and family friendly performance cars seen on the roads. Available usually in V6 and V8 petrol engine guises and combined with the Quattro technology, I must say it’s the RS models that would attract me to the brand rather than the models with economic engines so to speak. A few months ago Audi UK provided us with an RS Audi that for me has changed the thinking of the brand, the RS3 Sportback which was equipped with a humble (compared to its RS4 and RS6 brothers) 2.5 litre five cylinder turbocharged engine and indeed is still to date the fastest production road car I have ever driven. The aforementioned RS3 pushes technology and specification to a new level for the brand and on taking delivery of what I would say is Audi’s flagship model, the all new Audi A4, I was really looking forward to see just how good it was and I wasn’t disappointed. Outside the latest A4, it is hard to distinguish what model it is, due to the varying models all sharing similar silhouettes and sweeping lines. It isn’t overly huge looking and thus could be mistaken for the likes of an A3 saloon or at a glance of the side profile could easily be the larger A6 however it is neither and most certainly is the new A4. So now that we have established exactly what I drove for a week I must admit it is a very sleek and stylish car, being the S-Line trim level the car see’s several style and comfort features not available on the base model cars and sets it apart in a good way from the others. As said before, the A4 isn’t overly big; a practical size that won’t see you struggle whilst parking around town and the LED headlamp design is one of the first things that caught my eye with this test car while subtle S-Line badging on the front wings remind me this car was not an ordinary Audi. Another thing I noticed was the lack of wheels I would expect with an S-Line model and indeed Audi UK had removed the £1200 optional 19 inch alloy wheels and fitted the smaller wheels pictured on the car equipped with winter tyres due to the unpredictable weather for the first few months of the year. 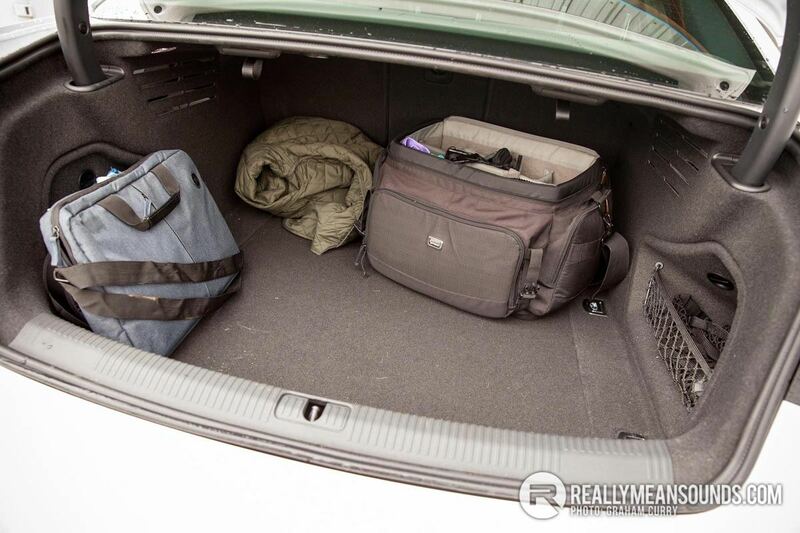 Opening the boot revealed a sizeable load space and with the split fold rear seats made it ideal for carrying longer items now and again however due to being a saloon rather than hatchback, the load entry area is a little restrictive, however better than the likes of the Jaguar XE and I was easily able to fit all of my equipment into the Audi. 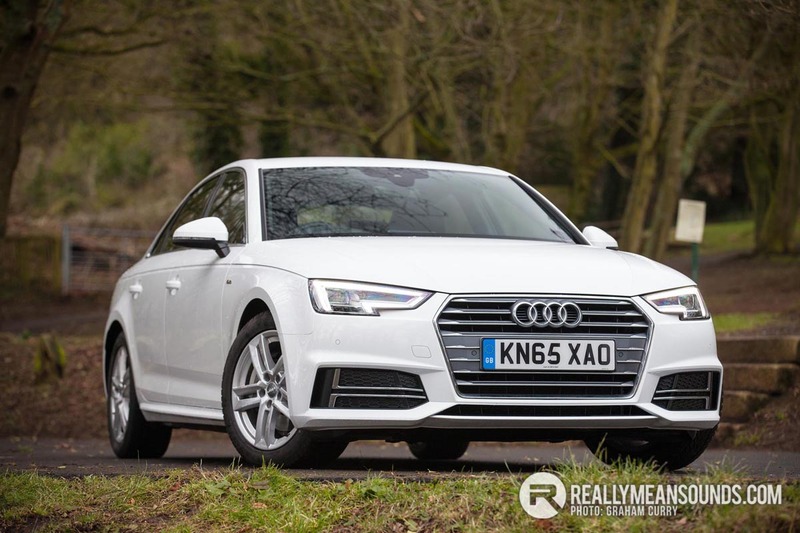 Inside this A4 S-Line is well finished throughout, comfortable and provides, just like the Jaguar XE a nice low slung driving position with huge amounts of rear room in comparison. In fact I would go as far as saying that Audi have done very well to make the rear so accommodating for grown folk to be comfortable on a long haul. The seats were sublime in this car and with the Leather/Alcantara option (as fitted to test car) only being £450 I feel it is a worthy option to tick if ordering new. The alcantara continues onto the door cards and these flow into the dash superbly with lots of clean cut lines and a very modern feel to it. One slight disadvantage of the test car for me however was the lack of heated, electric seats, being an S-Line and coming in at just shy of £35k without options I wouldn’t expect to have to tick them as an option, however this is quite common on the higher ends brands, as it allows each owner to customise their pride and joy to the spec they wish. The infotainment in this test car was amazing and with a technology pack coming in at £1450 along with a vision pack at a mere £1150 I can only assume that between them, somewhere the “Virtual Cockpit” option was added to this test car. 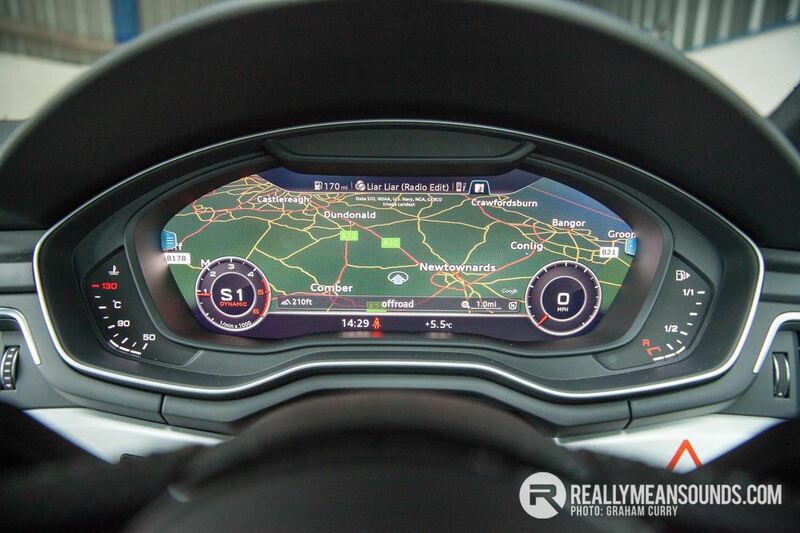 This feature that Audi has launched is described as “the instrument cluster of the future” and I must admit it was epic. Epic in the fact that all of your sat nav, Bluetooth and all associated gubbins that are usually displayed on a screen central in the dash, are actually displayed on the digital instrument cluster behind the steering wheel, not only making them much easier to see but as a result keeping things safer as the drivers eye rarely needs to leave the road. The A4 still has the central screen however, which is a little odd as I do feel that you could get away with the “dual display” so to speak but they did integrate well together. The infotainment is all controlled from a wheel on the centre console, just on front of the gear selector and although it was easy to navigate with for most things there was some down sides for me. The position of the selector wheel was quite awkward to use due to the gear selector being in the way, I feel if these were swapped around things would have been much easier for me. Also on using the sat nav, the keyboard entry has to be done via the wheel which is tedious and time consuming, a touch screen would have been a better offering I feel. An abundance of USB ports could be found throughout the Audi A4 for connectivity as well as charging and as expected Bluetooth, AUX input, DAB radio etc are all fitted and this test car has the very useful reversing camera accompanied by rear parking sensors. Engine wise this S-Line model was equipped with the 190bhp 2.0 litre diesel unit producing just shy of 300lb/ft and joined to the seven speed S-Tronic gearbox was far from sluggish. Due to the small wheels and winter tyres, the car struggled for grip but I can imagine that on the 19” wheels and tyres that this wagon would pull like a steam train. Punchy and refined with plenty of go, that is the best way to describe this engine and gearbox combination and on the topic of the gearbox it is smooth and reacts well in sport mode as well as using the paddles to shift manually. Driving the A4 S-Line was well balanced if a little soft and forgettable compared to the likes of the Jaguar XE which was precise and entertaining however the steering did feel sharp and the Audi is equipped with varying driving modes such as Efficiency, Comfort, Auto, Dynamic and Individual which allows the driver choice over how they want the A4 to respond to the roads and driving style at any time. 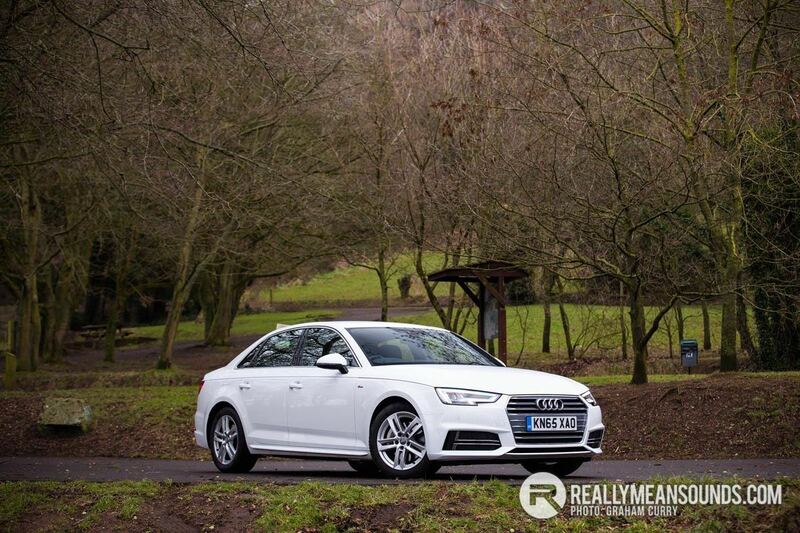 So who would the new Audi A4 S-Line suit? 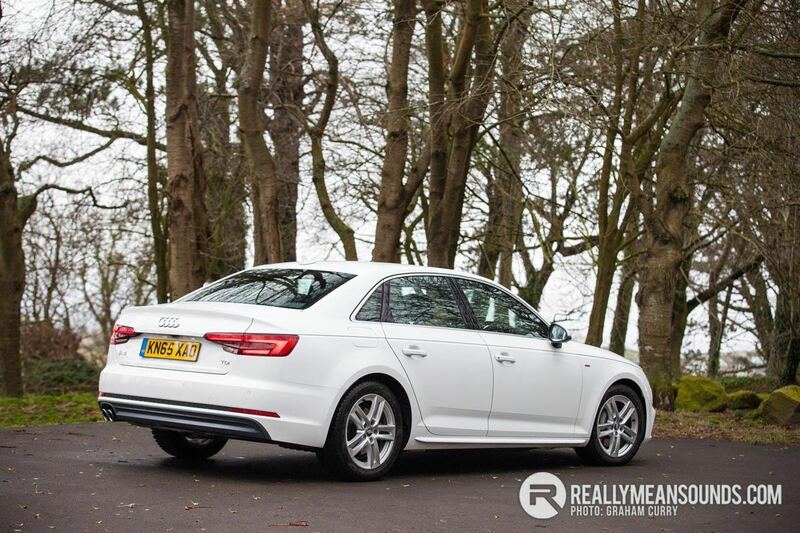 Well it is certainly poised for the executive car market and unlike some in the category the A4 could very easily cope with family life and also with optional roof carrier’s etc slide into the active lifestyle in a heartbeat due to the sheer amount of tech and comfort and quality inside. The instrument cluster in that is ace! | The instrument cluster in that is ace! 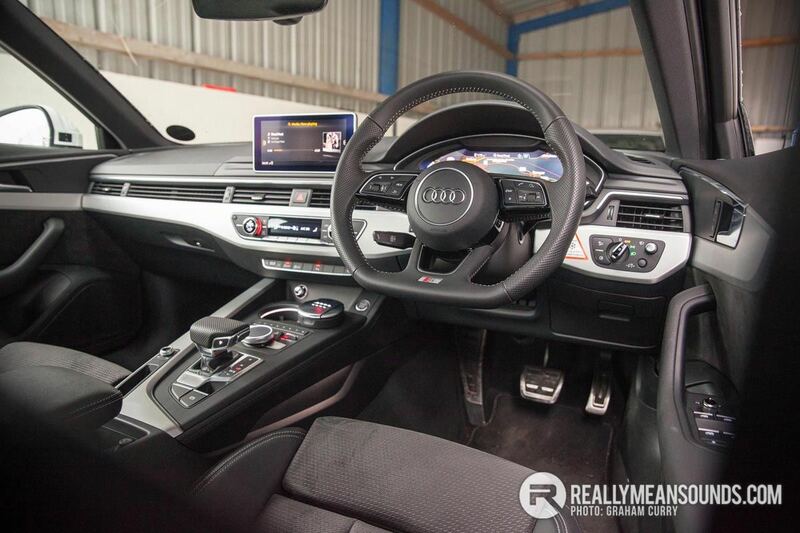 Agreed, actually the whole interior look absolutely class. The only thing I dont like are the rims. They are very 'SE' looking ---edit - just read the rims swap on the write up.. Does the screen in the centre console fold away when not used/switched off?